This is how we start ending up with prot wanting SP again. If it scales with SP and we don't want it using SP, then it must scale better with strength, but then it might scale too well compared to DKs and warriors so it gets nerfed... next thing we know we're rolling on mage weapons again. This is true. 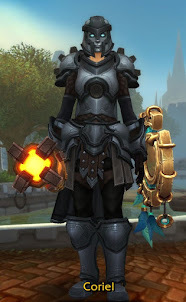 The line between Prot paladins going for tanking weapons and spelldamage weapons is very thin. It's easily possible for a ShR that scales with spellpower to push Protection into caster weapon land, much to the dismay of the mages. Your Holy Shock critical hits reduce the cast time of your next Flash of Light by 0.75/1.5 sec or Holy Light by 0.5/1 sec, or increases the damage of your next Shield of Righteousness by 50/100% of your spellpower. Holy gets a nice 1-2 punch with a crit Holy Shock followed by a powerful Shield of Righteousness. It's deep enough in the Holy tree that Protection and Retribution can't get access to it. Holy Shield is melee-only, so it should be okay in PvP. If you use your IoL proc on ShR, you can't use it on an instant or fast heal. It might resurrect the Shockadins with a 37/0/34 build, but I don't really see that as a negative. A new build type would be amusing. Your link seems to just be linking to this post. Maybe it's just being weird on my end. Choosing between offense and defense would be cool. I can see how a build like that would put out some decent burst, and completely ignore armor. I wonder if the next expansion would bring out strength-oriented shockadins; using the crit on ret gear and double-dipping with sheath and IoL for insane SotR damage. How about Blessed Life having a proc for a double-damage SotR or something elsewhere that caused crits to make SotR free. Ooh, enlightened judgements applying to SotR. Or is that just a clone of glyphed AS? Why not have it scale with just spellpower unless you're affected by Righteous Fury? As long as prot paladins can do the same or better damage with it via block value than via spellpower there won't be any issues pushing us toward caster swords. Well, it depends on the coefficients. I'm sure you could rig it such that the scaling still matched the current curve. It doesn't scale at all for Holy currently, and I think with just a little bit of effort it could become something Holy enjoys when soloing. Scaling with spellpower except when under RF sounds very complicated. Just think of what the tooltip would look like As well, that would mean that a Holy paladin couldn't use it to build threat, if that were ever necessary. I doubt we'd ever see a situation where Holy needed to tank something, but I'd rather not cut off options if you don't have to. @Kleps, I fixed the link. Also, you can't actually get both Sheath and IoL in the same build, so I think that won't happen. I think Shockadins would still be in spellpower gear. Darkmoon Card greatness shows that Blizzard knows how to pick the higher of two stats. Why not apply the same to judgements, buff the coefficients and then make them SP or AP, whichever is higher (or perhaps better: whichever does more damage). No offense to you, but this feels too much like we're trying to make a tanking ability into a damage ability for a healing tree. I'd rather make the current spells work rather than throw another one into the pile and hope it works. Making it a "when RF is off" is a bit too complex and not much 'fun.' What is fun anyway? That's such a hard thing to measure. The new shockadin will be for the next expansion. Part of it is that I feel the paladin plays "nicely" at about 3 abilities on 6-10s cooldowns. Holy only has 2, normally. I enjoy using ShR while soloing. It fits nicely in between HS and Judgement. But it hits for pathetic damage, and that damage will never increase no matter how much better my gear gets. "Scaling with spellpower except when under RF sounds very complicated." Unless I'm mistaken, there is already a talent that is constructed in a similar fashion, with Righteous Fury as an exception condition: Fanaticism, in the Retribution Tree, which reduces threat by 30%, except when Righteous Fury is active. Yes, Fanaticism is complex. But it's necessary. As well, everything there modifies threat, which helps keep the complexity down. RF changes your threat, and Fanaticism changes your threat. It doesn't involve damage or healing or anything else. "...or increases the damage of your next Holy Shield by 50/100% of your spellpower." Like Klepsacovic said, I think having to choose whether to use your procs for healing or damage is fun, though you already do this to some extent with the Holy Shock itself. Having said all that, I'd prefer it if it wasn't so RNG. My success seems to ride a lot on IoL procs as it is! They should make Consecrate a heal over time tick as well to loosen up on the healr reqs for fights. Frankly, its a mundane task watching life bars shoot up and down and wackamole accordingly, if they were to make less life bars move around, healers could do what they truly want to do and be support/dps. I also was gonna say, for a protadin, you get some crazy synergy with the talent that gives SP based off your HP (near bottom of prot tree) it has uptu 30% bonus SP based off your hp (which gets boosts from sacred duty, imp kings, and weapon speciality). So what this means for a tank is not only do they get more tanking agro with SP for spamming consecrate, rebuke, and RD but they also lighten up the window for weapons that are actually useful on a tank (vs all +expertise/str/stam/armor stat stacking weapons). Sorry, Holy is the most overpowered class already (~30% of top 100 arena). Your change only focuses on one small part of the game: solo holy pve. If you look at other parts, like arena, you'll realize your idea is not a good one. Holy paladins need (some) nerfs already. Ultimately, I think the long-term solution is simply to make Holy Light, Flash of Light and Holy Shock scale with attack power rather than spellpower (obviously at far lower coefficients). This would allow Blizzard to eliminate spellpower plate from the game, as Holy Paladins would start gearing for Strength. It would also allow Holy Paladins to use their raid gear for farming effectively, since the same gear would improve their healing and their damage-dealing abilities.